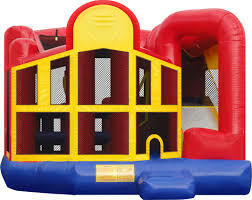 The Module combo has a large bouncing area and pop ups with log crawl and basketball hoop. The other side has a climbing ladder with slide so there is lots to do in this huge combo unit. It also has a module panel on the front so you can add a banner to make it a theme for your party. We have plenty to choose from such as Happy Birthday, Sports, American Flag, Sponge Bob, World of Disney and the list goes on.